Written by Nancy Jorgensen on 01 April 2019 . Dr. Jessica Stroupe examines a cat for possible injuries after it was hit by a car. Other than a road rash, the cat was fine. Veterinary technician Carolyn Watson holds 33-year-old horse Teddy, while Dr. Clifford Miller collects a blood sample. Miller operates a mixed-animal practice in Moberly, Mo. For this specific type of blood panel testing, Miller must collect the blood quickly and freeze the plasma right away. It will be sent to Michigan State University for testing. Large-animal veterinarians must often make “house calls” to perform their services. Here, Miller conducts a pregnancy ultrasound on a horse for one of his clients. Miller, a 2000 graduate of the University of Missouri College of Veterinary Medicine, opened Green Hills Veterinary Clinic in his hometown of Moberly, Mo., in 2003. Dr. Jessica Stroupe, right, consults with client Baylee Fitzgerald of Glasgow, Mo., about the condition of her cat that had suffered minor injuries after being hit by a car. Here, the veterinarian explains X-rays that show no bones were broken. The daily schedule at a mixed-animal practice is everchanging, Stroupe said. Here, she vaccinates and castrates cattle for a client. Earlier in the day, she helped work 4-H show cattle. Initially planning to be a marine biologist, Stroupe decided to become a veterinarian late in her college career and attended the Mizzou vet school. She worked at Howard County Veterinary Services before taking over the business in 2016. Veterinary assistant Abigail Shetler helps keep a client’s dog calm before stitches are removed at Miller’s clinic. Both Stroupe and Miller say vet assistants and techs are invaluable to their practices. When Dr. Cliff Miller graduated from the University of Missouri College of Veter­inary Medicine in 2000, the faculty named him most likely to succeed in his class. Today, Miller’s Green Hills Veterinary Clinic in Moberly, Mo., is considered by several industry leaders as one of the state’s most successful mixed-animal practices. The MVMA estimates that of about 2,000 veterinarians practicing in Missouri, around 30 percent handle large animals. In certain areas of MFA territory, however, large-animal practi­tioners are in short supply, Antweiler said. “If you’re raising cattle, and there’s no readily available vet, that’s a problem,” he said. Dr. Tony Martin, staff veterinarian for MFA Incorporated for 32 years, has seen a drop in the number of rural large-animal vets as farm numbers have declined. Martin manages MFA’s Animal Health Department and oversees sales of vac­cines, medications, ear-tag identifications and feed additives. Dr. Fred Gingrich, executive vice president of the American Association of Bovine Practi­tioners, thinks the issue isn’t a shortage of vets but rather a distribution problem. In 2016, an association task force studied the issue. In fact, the task force expressed concern that an oversupply of vet-school graduates, along with the recession that began in 2008 and a decline in the number of livestock operators, could lead to too many large-animal vets. The association has 5,000 members and estimates that up to 12,000 vets in the U.S. report some cattle practice activity. That’s out of 120,652 veterinarian positions in the U.S., according to the American Veterinary Medical Association. Dr. Bonnie Rush, interim dean of the Kansas State College of Veteri­nary Medicine, takes a more positive stance. “Demand for veterinarians of all disciplines is at an all-time high,” she said. Vets who treat large animals enjoy a number of benefits. The cost of living is usually lower in rural areas, and grant programs are available for students who agree to practice in remote locations. Gingrich adds that plenty of successful vets treat large animals, and Miller’s thriving practice backs up that claim. Miller started his clinic in 2003 as the lone veterinarian with two employees. Today, he employs three other vets, all grad­uates of the Mizzou vet school. “I have been fortunate to attract quality mixed-animal vets without a problem,” he said. In addition, Miller employs 12 other team members, in­cluding four veterinary technicians with two-year degrees. Miller grew up raising hogs and cattle in 4-H and FFA. He, his wife, Suzanne, and their three sons—Colin, 11, Grant, 9, and Ryan, 6—live in Miller’s hometown of Moberly. Miller and his dad, Ed, partner on a nearby cattle and grain operation. “I started telling people in second grade that my career goal was to become a vet,” said Miller, immediate past presi­dent of the MVMA. There’s no normal day in his mixed-animal practice, Miller said. Most the time he works in the clinic, which includes facilities for large and small animals, but he also makes farm visits. In late January, he called on a cattle operation when the temperature fell to minus 10 degrees. But he said the benefits of working outdoors with animals in beautiful weather offsets brutally cold or scorching hot days. Most of Miller’s cattle practice involves reproduction and obstetrics. The average Missouri cattle herd is about 40 cows, and Miller’s customers reflect those numbers. Many work a full-time job while raising cows on the side. Miller also serves a few larger operations. In 2017, the Federal Drug Administration initiated a Veterinary Feed Directive requiring livestock growers to use certain antibiotic products in feed and water only on the order of a veterinarian. “We have seen some increase in demand on our time as a result, but most of our customers were already using us for vet services,” Miller said. Another trend that may help producers and their vets is the move toward ear-tag programs that identify cattle as meeting certain health standards, from nutrition to vac­cination. Miller works with customers who participate in programs such as MFA’s Health Track, a preconditioning verification program for beef calves. K-State’s Rush agrees that there’s a major trend toward producers and their veterinarians gathering more data on livestock with a goal of making better decisions for animal health, welfare and increased profits. “Large animal and rural practices continue to adopt new technology, allowing more efficient and detailed, real-time communications with clients,” she said. Antweiler said he believes that vets and livestock growers will cooperate more in the future. Miller hatched an idea that illustrates how a vet can work with smaller cattle producers to increase earnings. For nine years he’s partnered with eight customers to pool calves and market them together. Despite the challenges of a large-animal veterinary prac­tice, Miller said he loves working with animals and the peo­ple who care for them. Still, that passion isn’t always enough to succeed. It takes a higher level of dedication. Your next large-animal veterinarian may be a woman. Dr. Jessica Stroupe falls into those statistics. The mixed-ani­mal veterinarian graduated from the University of Missouri vet­erinary college in 2012, and she already owns her own practice in her rural hometown of Fayette, Mo. During and following vet school, Stroupe worked with the owners of Howard County Veterinary Service, Dr. Richard Taylor and Dr. Kenneth Vroman. Taylor retired in 2012 when Stroupe started at the clinic, and she took over the business when Vroman retired in 2016. “When the opportunity came up, I jumped in,” Stroupe said. About half of her practice involves cattle, and the rest is com­panion animals, including cats, dogs and horses. Even though female large-animal veterinarians may have clients here and there who at first doubt their abilities, Stroupe said successful interactions can prove their value and build re­spect. Her cattle-producing clients were accustomed to working with male veterinarians, and it took time to build trust. Dr. Fred Gingrich, executive director of the American As­sociation of Bovine Practitioners, reports that one-third of the association’s 5,000 members are female. While many students know they want to be a vet from childhood, Stroupe took a winding path. She grew up as a town kid in Fayette and attended the University of West Florida planning to become a marine biologist. “Along the way, my interest in animals grew broader,” Stroupe said. Most students complete four years of under­graduate studies before applying to vet college. Stroupe didn’t decide to become a vet until just before her junior year. She built up the academic prerequisites and met the 400 hours of working with animals required by shadowing a veteri­narian and working at an animal sanctuary. The Mizzou vet school accepted her early—prior to her senior year. The cost of education can be daunting, but Stroupe avoided a large debt load by earning academic and athletic scholarships for her un­dergraduate study. She excelled in cross-country and track in high school and college, and even­tually ran in the Boston Marathon. An anony­mous donor provided a scholarship for her final year of vet school. While Stroupe never intended to return to Fayette, she married her high school sweetheart, Patrick, who worked on his parents’ dairy farm while she commuted to vet school in Columbia. They built a tiny cabin on the farm to minimize expenses. She worked weekends at the vet clinic and lived frugally, driving an old Toyota, pack­ing her lunch and managing without a smartphone. Stroupe discovered the benefits of living in a small town when she developed cancer in 2017. She received great sup­port from the community, her family and the clinic staff. “Knowing my patients and clients were taken care of made my treatment and recovery much easier,” Stroupe said. She and Patrick are now parents to 2-year-old son, Leland, and they built a larger home for their growing family. Being a wife and mother while running a veterinary practice can be challenging, Stroupe said, but her passion for working with animals makes it all worthwhile. Aspiring veterinarians willing to work in underserved rural areas are eligible for several types of grants to help with education costs. The state of Missouri offers the Dr. Merrill Townley Large Animal Veterinary Student Loan Program. The loan provides $20,000 for living and educational expenses incurred during their veterinary education process for six individuals per academic year. The loans are forgiven provided the students practice large-animal veterinary medicine in a defined area of need ($20,000 for each year of service provided). Applicants are selected by an appointed advisory committee on an annual basis. For more information, contact the Missouri State Veterinar­ian’s office at 573-751-3377 or visit online at agriculture.mo.gov/connect/ youth/vetstudent.php. The Veterinary Training Program for Rural Kansas, a state-funded workforce development program at K-State, promotes rural practice success. Five students are enrolled in every class and receive $20,000 a year in loan forgiveness for each year after serving an underserved county in Kansas for a minimum of four years. Contact 785-532-4892 or visit online vet.k-state.edu. Written by webadmin on 12 March 2019 . Click on the issue below to view magazine flipbook. Created on 12 March 2019 . Written by Allison Jenkins on 05 March 2019 . Executive Director Richard Arnett has worked with the MCIA since 1983 while he was still a student at the University of Missouri. He grew up in the seed business, too. His father was a contract seed grower in Sedalia. The seeds are then divided into sub-samples, bottom left. The number of sub-samples depends on the number of tests to be performed. Robin Crane measures out samples of 50 seeds on a wooden tray. Those seeds are then placed on a wet paper towel and rolled up for a germination test. Trent Hall, a registered seed technologist with the Missouri Crop Improvement Association, prepares a treated sample of MorSoy seed for a germination test. The seeds, which are hand-treated in the lab, will be evaluated after they germinate for seven days under “ideal” conditions. A sand germination test also helps the technologists evaluate seed quality under more field-like conditions. Seed that passes the test will be branded with the MorSoy name, packaged and sold to soybean growers throughout MFA territory. Before they ever reach a farmer’s field, MorSoy varieties face an extreme obstacle course to weed out seed that can’t handle the pressure. First, the varieties must perform well in replicated variety trials across MFA’s territory. Next, the seedstock needs to survive the rigors of production and processing. Even then, there’s no guarantee the beans will make the cut. That’s because the final hurdle is the Missouri Crop Im­provement Association, where the seed has to pass a battery of tests before it is deemed worthy of MFA’s own MorSoy brand. At the MCIA laboratory in Columbia, Mo., each seed sample undergoes up to nine different evaluations, from germination and purity to herbicide tolerance and accelerated aging. The result is an objective, scientific assessment of the seed’s quality, said Richard Arnett, MCIA’s executive di­rector, no matter the company, brand, technology or variety involved. MFA Incorporated has used the Show-Me State’s non-profit crop improvement association for inspect­ing, testing, verifying and certifying seed since 1947. In fact, MFA is the oldest member of the MCIA, which was formed in 1904 as a student club at the University of Missouri. Early work focused on the improvement of corn, eventually branching out into other crops. Today, the MCIA provides inspection and testing services on more than 800 brands or varieties and more than 100 different species or crops. While MFA’s Seed Divi­sion maintains its own strict quality-control procedures from start to finish, having third-party verification by the crop improvement association gives growers added assurance. With the MCIA’s independent testing, those claims of quality are backed by more than just MFA’s word. They’re backed by the expertise of registered seed technologists such as Trent Hall, a member of the Society of Commercial Seed Technologists, which works with the Association of Official Seed Analysts to develop the rules for testing seed in the U.S. It takes a special kind of person to analyze seed, Hall said. The job is meticulous, repetitive and exacting. The MCIA handles around 4,000 samples a year, Hall said. By far, soy­bean is the most widely tested species, but the lab also analyzes wheat, small grains, grasses and a wide range of miscellaneous seeds. Most recently, he said, cover crop seed has become a bigger part of that mix as the practice has grown more popular in Missouri. When seed arrives at the lab from the production companies or farmers, key identifying information is recorded in the computer, and then the sample is divided into smaller portions for testing. The number of sub-samples depends on the number of tests to be performed. Varietal purity test — Seed sam­ples are scrutinized by MCIA staff for the percentage of pure seed, inert seed, other crop seed and weed seed. They’re also checked for hilum color, which can differentiate off-types. Normal germination test — Seeds are “planted” on a wet paper towel, rolled up and placed in the germinator for seven days at 77 degrees Fahrenheit to simu­late ideal planting conditions. Each test includes a total of 400 seeds, 50 seeds per towel. After seven days, the towels are unrolled, and ana­lysts count the number of seeds that germinated properly. In Missouri, the minimum germination level for soy­beans is 80 percent. For MFA, that’s not good enough, Fleming said. Sand germination test — Seeds are planted in a tray of sand and allowed to germinate for seven days under those “ideal” conditions (77 degrees). MCIA staff then records the percentage of normal germination from that sample, which consists of 100 seeds (200 per flat). Treated-seed germination test — Seed is hand-treated in the lab with insecticides or fungicides and then put through the rolled-towel germination test. The treated seeds are then analyzed to see how the treatment affected germination. Herbicide tolerance — Seeds with tolerance traits for glyphosate and sulfony­lurea (STS) are tested in-house at the MCIA lab; others, such as those with dicam­ba, glufonsinate or 2,4-D tolerance, are sent to other labs equipped to handle them. To test for tolerance, seeds are soaked in the relevant herbicide overnight, rolled in wet towels and then evaluated for germination the next day. Accelerated aging stress test — Seed is placed in a small, divided tray with 40 milliliters of water in the bottom, and then subjected to temperatures of 105.8 degrees for 72 hours in the lab oven. After the seed is removed from the oven, it undergoes a normal germination test. Depending on the number of tests performed and the lab’s workload, the entire process can take anywhere from two to four weeks. Arnett, who’s been with MCIA since 1983 when he was a student at Mizzou, says most farmers and even industry personnel have no idea how much testing goes behind those beans. For more information about the Missouri Crop Improvement Association, visit online at moseed.org. Learn more about MFA’s MorSoy and MorCorn brands at mfaseed.com. Created on 05 March 2019 . Written by Kerri Lotven on 04 March 2019 . The Japanese beetle is one of the most loathed invasive pest species for farmers in the Midwest. Jay Fogle, a fourth-generation dairyman, grows alfalfa on his farm in Peculiar, Mo., to feed to his cows. That alfalfa is important to his overall operation, which is why he works with MFA’s Crop-Trak Consultant Erica Wagenknecht to diagnose and resolve any problems that occur in his forage fields. Fogle and Wagenknecht review cropping plans from the previous year to prepare for the upcoming season. Crop-Trak’s Wagenknecht points out alfalfa in Fogle’s field. Though dormant this time of year, the forage typically provides four to five cuttings a season. “Having someone out on your farm every week helps hold us accountable to get the most out of our production,” Fogle said. Japanese beetles were in full force on many Midwest farms last summer, including here on soybean plants at MFA’s Training Camp in Boonville, Mo. The pests can cause extensive damage to leaves of soybeans, possibly hurting yield if thresholds are high enough. Dr. Kevin Rice speaks to MFA employees at the Winter Agronomy Meeting in January. Here, he explains an experiment he and two grad students conducted last summer in which they used an aggregation pheromone and pyrethroid nets to attract and kill Japanese beetles. The experiment worked on tens of thousands of beetles, but Rice said he isn’t recommending this tactic for commercial growers yet. A brown marmorated stink bug, pictured here, is differentiated from its native counterpart by the light and dark banding found on its antenna. Kelsey Benthall, a University of Missouri graduate student, arranges soybean looper caterpillars on leaves to show the growth stages. She and fellow student Emily Althoff are working on an experiment to compare feeding preferences using two different seed varieties. This summer, Benthall will work with Rice and the pyrethroid nets to determine field damage and how far the nets should be spaced. Stepping onto his porch one day last June, Jay Fogle looked out over his favorite alfalfa field on his farm in Peculiar, Mo. Something wasn’t quite right. For Fogle, a fourth-generation dairyman, alfalfa equals milk production, and he need­ed answers. When Wagenknecht arrived at the farm, she swept the field with a net and found the source of the problem—potato leafhop­per—which causes a discoloration on the leaf tips known as hopperburn. It wasn’t an insect she had encountered before on this farm. A native species, the potato leafhopper feeds on the un­derside of leaves in a wide variety of plants. As it feeds, it injects a toxin that, in alfalfa, reduces yield, lowers protein content and increases root rot and stand failure. In Missou­ri, potato leafhopper can produce two to three generations each summer. In addition to alfalfa, Fogle raises corn, soybeans and beef cattle, operates a bakery and milks 50 cows twice a day. He also experiments with other crops such as hay beans and sorghum. Wagenknecht got to work and did some research, locating a product that would fit the requirements. Fogle has participated in MFA’s Crop-Trak for 10 years, and Wagenknecht has scouted roughly 200 acres of the farm for the past four years. The program employs independent consultants who work with farmers on cropping plans and scout fields once a week during the growing season. Fogle said he’s learned something from each agronomist who has scouted for him; in turn, Wagenknecht says she and her fellow consultants learn from scouting such a diverse operation. Crop-Trak consultants encourage growers to use the integrated pest management model, which brings together a broad-based approach to control insects. Cultural practices such as crop rotation, soil health management and “trap” crops—planted to attract insect pests from another crop—help to reduce or eliminate harmful insect populations. Biological controls introduce insects’ natural enemies to reduce damage caused by a specific population. Chemical controls are sprayed to prevent, destroy or repel pests. There are some insects, like cutworms, that growers can’t react to fast enough, Worthington said, so preventative measures should be taken at the proper timing. But not all insects in any given field are bad, he stressed. Lady beetles and their larvae control aphids and mites. Lacewings can quell aphids. Parasitic wasps can repress caterpillar populations and other insects. Even spiders and assassin bugs are predators that do their part. Eventually, Worthington said, he expects these biological controls to become more prevalent. From a stewardship standpoint, it’s important to understand what threats move so rapidly that pre­ventative control is warranted, Worthington added. Year in and year out, MFA’s crop scouts and agronomists have an idea of what they need to watch for each season, Worthington said. With global trade often comes invasive insect species. The Japanese beetle, for example, was first discovered in 1916 on the East Coast but is thought to have entered the U.S. as larvae via imported plants before inspections began in 1912. When dealing with eggs and larvae, it’s almost impossible to catch everything, but the issue with invasive species is their natural enemies usually don’t make the trip with them, said Dr. Kevin Rice, University of Missouri assistant professor of entomology and state Extension specialist. 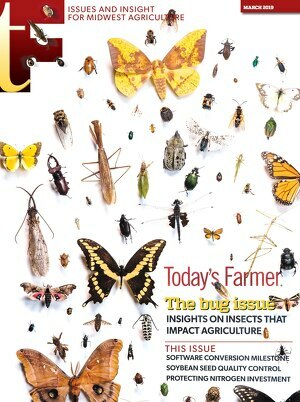 Rice said the lack of natural predators leads to a couple of problems—higher populations and greater economic damage certainly—but it also means entomologists in the area typically haven’t studied the insect’s biology or ecology to figure out if there are better ways to manage it. Therefore, chemical control becomes the default. Once forced to rely on chemical control, Rice said, there are often secondary pest outbreaks due to repeatedly spraying for one insect. For example, growers also may wipe out the natural enemies for a native pest species such as aphids, which can then grow out of control. Persistent spraying also puts products at risk for the target pest developing resistance. Before joining the MU staff in January 2018, Rice worked in Pennsylvania and outside of D.C. in field crops. But he said he’d never seen populations of Japanese beetles like he saw here in Missouri this past summer. Though the beetle was introduced in the early 1900s, it moves slowly. It’s taken roughly 100 years to make it this far west. Missouri is right on the invasion front, Rice said. The good news is the wasp, known as Tiphia vernalis or the more common “spring Tiphia” was redetected in 2018 after 10 years in Meramec State Park near Sullivan, Mo. “It’s going to come behind the Japanese beetle, establish its own populations and lower the Japanese beetle population to a much less economically damaging level,” Rice said. There are a lot of questions about chemical resistance and Japanese beetle, he continued, but currently the insect shows no resistance to standard controls. Soil treatments aren’t recommended for Japanese beetles for similar reasons. Killing all the grubs in one field doesn’t prevent them from moving in from adjacent areas. It isn’t an economically viable solution, Rice said. Soybeans are also resilient plants that can withstand some leaf damage, he added. In corn, damage from Japanese beetles is largely cosmetic, he said. At silking, they can reduce pollination, but if the silks aren’t present, the issue isn’t that bad. A more recent discovery, the soybean gall midge, began making headlines in the Midwest in 2011. Initially isolated to a few fields, the pest has been reported in several states including Iowa, Nebraska, South Dakota and Minnesota. Because of its proximity to state lines, Rice said he’s willing to bet it’s also in Missouri but hasn’t been detected yet. Unchecked, a 100 percent infestation results in significant yield loss. The damage usually starts to appear on the edge of fields and may correspond with disease. Though the soybean gall midge hasn’t been found in Missouri, Rice is advising growers, scouts and Extension agents to be on the lookout in the upcoming growing season. BMSB made its way to the U.S. in the early 2000s. Native to Asia, the BMSB is an extreme generalist and feeds on more than 200 species of host plants, including vegetables, fruits, field crops, ornamentals, woody shrubs and hardwood trees. The insect also overwinters in houses, which is often where it is first reported. The way to tell BMSB from native species is to look for light and dark banding on the antenna. The instars, which look like little ticks, also sport similar coloring, making it distinguishable in all stages of the life cycle. BMSB likes to switch up its diet, consuming a balance of protein and carbohydrates as it flies between tasty choices like soybeans and orchards. By balancing their diet, females produce more eggs, ensuring the continuous survival of the species. Due to its varying appetite, BMSB is mostly found on the edges of fields near woody areas as the pest moves back and forth between meal sources. BMSB reduces quality and yield in both corn and soybeans. Intense early-season feeding can damage seeds and seedlings. Growers may notice what is called “stay green syndrome,” in which the plant fails to continue developing. This causes problems at harvest if the interior of the field is dried down but the edges aren’t. By running a series of weather and temperature models using data from the last 30 years, Rice determined that BMSB produces two generations in Missouri. Further evaluation will investigate how temperature increases change the population boundaries in Missouri and neighboring states. Because BMSB was doing so much damage in the mid-Atlantic, in 2005 the USDA sent agents to Asia to find a natural predator to the stink bug variant. There, they located the Samarai wasp, which is native to China, Japan, Korea and Taiwan. The news hit the media, and the fear was the researchers had let the quarantined wasp escape. Since that time, the Samarai wasp has been found in 10 other states, indicating it’s been in the U.S. for some time. Rice said that’s a positive for those facing BMSB damage. Female wasps lay their eggs in the stink bug eggs, and the larvae develop in the eggs and emerge. And though it looks similar to BMSB, Rice reminds scouts and growers that the spined soldier bug is a “good guy” and preys on a variety of other insects. Also native to Asia, the kudzu bug was first detected in Georgia in 2009. It’s currently in nine states, including parts of the Bootheel. Like BMSB, the kudzu bug is also found on field borders, produces several generations per year and overwinters in homes. In addition, kudzu bugs release a chemical that causes skin rashes. The sugarcane aphid was first discovered in the 1970s in Florida, but in 2013 large populations of the pest made a switch from sugarcane to sorghum. It is now in 15 states, including Missouri, Arkansas, Illinois, Kansas and Oklahoma. There are several insecticides that work well on the aphid, but frequent scouting and early detection are important. If the population gets to a certain threshold, insecticides can’t control it. Detected in 2014 in Pennsylvania, the spotted lantern fly feeds primarily on grapes and sometimes hardwood trees. When they feed, they produce honeydew, which can lead to secondary problems of sooty molds. The spotted lantern fly lays its eggs on any flat surface, including stone, wood and metal, which means it has the potential to move throughout the country easily on transports such as semi-trailers, vehicles and railroad cars. The spotted lantern fly was originally thought to contain cathartin, a bitter acid that is harmful to mammals if ingested, especially foraging animals such as cattle and horses. The spotted lantern fly is a slow flyer and doesn’t look like anything native to the United States. If growers and scouts see one in their fields, Rice advises that they put it in alcohol and send him a picture for a definitive ID.